Watsonville, CA, April 2, 2019 – Just in time for spring and summer celebrations, Martinelli’s adds a new product to its family of Gold Medal premium sparkling ciders and apple juices, Sparkling Blush. Like all Martinelli’s products, Sparkling Blush is 100% juice made from U.S. grown fresh apples with a splash of raspberry to give it a crisp taste and beautiful pink color. 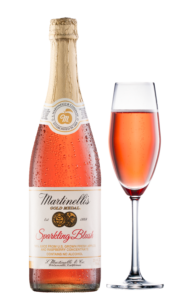 Martinelli’s Sparkling Blush is currently being introduced nationwide and should be available in most major retailers this year. Its light refreshing flavor, beautiful pink color and sophisticated vintage packaging have received rave reviews from consumers and retailers. Family-owned and operated S. Martinelli & Company has been producing Gold Medal premium quality sparkling cider and apple juice for over 150 years in Watsonville, California. Martinelli’s products are 100% juice, made from U.S. grown fresh apples and contain no added sweeteners or chemical preservatives. Its apple-shaped and champagne style glass bottles are iconic hallmarks of the brand. The company is led by fourth generation family member and CEO, John Martinelli.